26 September / October 2014 Elearning! millearnnial employees Learning and development organiza- tions are afected by Millearnnials in two primary ways: 1) As learning consumers, Millearn- nials are typically used to processing information in small chunks and having a variety of resources to choose from — from videos to discussion forums to Wikipedia. Regardless of their age, Millearnnials place high priority on ease and conve- nience; they want information to be readily available on command. 2) Most business leaders share the above traits. Additionally, they likely see marketing and other departments rapidly churn out new Web content, video demos, and sales and service sup- port tools. Therefore, their expectations for training are colored accordingly, to include: speedy, point-of-need delivery; cost efficiency; and high relevancy to business. Their tolerance for lengthy pro- gram development, big investments with long-term paybacks, and general lack of business understanding is low. How L&D departments and their sup- porting vendors respond to Millearnnial expectations over the next one to three years will likely determine their long- term future. FACEBOOK: A BRIEF GLIMPSE INTO TRAINING'S FUTURE Facebook epitomizes today's relentless business change. In 2011 — eight years after its founding as a social networking site for college students — Facebook was one of the most visited websites in the world. When the company went public in May 2012, it was valued at $104 bil- lion, the largest valuation to date for a newly public company. As of January 2014, Facebook had 1.23 billion active users. But the company's phenomenal growth has been accompanied by non- stop change. Shifts in user demographics, adoption by businesses, explosive smart- phone usage, and a string of technology acquisitions have opened the door to new markets and revenue streams, while requiring the company to morph at light- ning speed to meet ever-changing market expectations. Needless to say, traditional training approaches just don't cut it for a company moving this fast. 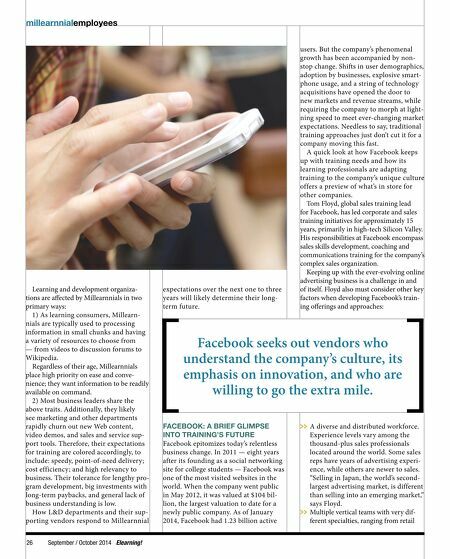 A quick look at how Facebook keeps up with training needs and how its learning professionals are adapting training to the company's unique culture offers a preview of what's in store for other companies. Tom Floyd, global sales training lead for Facebook, has led corporate and sales training initiatives for approximately 15 years, primarily in high-tech Silicon Valley. His responsibilities at Facebook encompass sales skills development, coaching and communications training for the company's complex sales organization. Keeping up with the ever-evolving online advertising business is a challenge in and of itself. Floyd also must consider other key factors when developing Facebook's train- ing oferings and approaches: >> A diverse and distributed workforce. Experience levels vary among the thousand-plus sales professionals located around the world. Some sales reps have years of advertising experi- ence, while others are newer to sales. "Selling in Japan, the world's second- largest advertising market, is different than selling into an emerging market," says Floyd. >> Multiple vertical teams with very dif- ferent specialties, ranging from retail Facebook seeks out vendors who understand the company's culture, its emphasis on innovation, and who are willing to go the extra mile.